The urban legend of President George H.W. 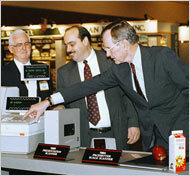 Bush staring in marvel at a grocery store scanner during his 1992 re-election campaign, which became a liberal media symbol of his inability to sympathize with the day-to-day lives of average Americans, still endures at the Times. The latest entry came on the front page of Friday Businesssection, ina story by Gerry Shih celebrating bar codes, "Game Changer In Retailing, Bar Code Is 35." The design was straightforward - 59 black and white bars. And the inventors' objectives were simple enough, too - to speed up the grocery checkout line and give supermarkets a new tool to track their stock. But the bar code has become much more than that since it was first used to read the price on a 10-pack of Juicy Fruit gum (67 cents) on the morning of June 26, 1974. Now they are used to board airplanes and track packages. Bar codes help people with diabetes calibrate glucose meters and researchers study the pollination habits of bees. They inspired a hand-held video game,BarcodeBattler, in 1991. They even played a role in the 1992 presidential race, when then-PresidentGeorge H. W. Bush, at a campaign stop, seemed surprised by what had already become a technological staple of everyday life. Andrew Rosenthal of The New York Times hadn't even been present at the grocers' convention. He based his article on a two-paragraph report filed by the lone pool newspaperman allowed to cover the event, Gregg McDonald of the Houston Chronicle, who merely wrote that Bush had a "look of wonder" on his face and didn't find the event significant enough to mention in his own story.Moreover, Bush had good reason to express wonder: He wasn't being shown then-standard scanner technology, but a new type of scanner that could weigh groceries and read mangled and torn bar codes. Yet the Timescontinuesrepeating the bogus Bush story(which, as stated by Snopes, originated in a February 1992 Times story) as fact. The last instance before Friday was reporter Mark Leibovich in an August 2008 story mocking John McCain.